I get it when people are upset about a documentary film maker telling them that there is lead in their Pyrex bowls and dishes. These things are part of people's childhood memories. These Pyrex bowls remind people of their grandmother - and nobody messes with memories of Grandma! Beyond grandma, a lot of people collect vintage Pyrex bowls and baking dishes. Not only are these pieces beautiful, but they make people feel connected to their mothers and grandmothers by using their kitchen items. To be told these things associated with so many happy feelings is possibly poisoning them is hard to hear. Some people (like me) even started collecting vintage pyrex as a safe alternative to plastic kitchenware - and to learn they were wrong in that regard is hurtful, frustrating and embarrassing. The problem is, that once you know that there is lead in the coating of your vintage Pyrex bowls (or Anchor Hocking dishe or similar dishware) you have to decide what to do next. Is there lead in vintage Pyrex bowls and baking dishes? Yes. Almost all vintage Pyrex bowls and baking dishes test positive for lead when using an XRF (a precision scientific instrument that will report the exact quantity of lead, cadmium and other heavy metals found in an item). Many vintage Pyrex bowls and baking dishes will also "swab positive" - this means that a reactive agent swab like the 3M LeadCheck swabs will be able to detect lead in quantities above 600 parts-per-million. This type of test works by getting part of the surface coating (usually paint) to rub off onto the swab. If leaded paint can rub off onto a swab, it's able to rub off onto your hands and get into your body. It is important to note that 3M LeadCheck Swabs can only accurately test certain types of things. It is possible that you might test your vintage Pyrex bowl with a swab and it won't turn red even if the dish contains a high amount of lead. Do not assume your dish is lead free because your LeadCheck Swab did not turn red! Where is the lead in vintage Pyrex bowls and baking dishes? The highest concentration of lead is usually in the paint on the outside of the Pyrex bowl or dish. With some very rare exceptions, the paint on the outside of both vintage Pyrex and vintage Corningware bowls and baking dishes will usually test positive for lead between 15,000 - 100,000 PPM lead. For reference, 90 PPM is the highest amount of lead allowed in items intended for children and if house paint has more than 600 PPM lead, it is considered "lead paint" and needs remediation. 15,000 PPM lead is a LOT of lead. 100,000 PPM lead means that a full 10% of the paint formula is pure lead. That is a LOT of lead. Do you have vintage Pyrex dishes? Check the Lead Safe Mama website to see if a pattern you own has tested positive for lead: See if your vintage Pyrex design has tested positive for lead. Tamara Rubin is the director and producer of the forthcoming documentary, MisLEAD: America's Secret Epidemic and is also an independent lead safety advocate online as The Lead Safe Mama. She runs the Lead Safe Mama website where she posts the results of lead tests. Most of her lead tests are performed with a non-radioactive source XRF instrument which can detect exact quantities of lead, cadmium and other heavey metals in the single digit parts-per-million (PPM). Does the milk glass used in vintage Pyrex contain lead? The milk glass interiors used in many vintage Pyrex and Anchor Hocking pieces commonly contain lead. The lead in milk glass is probably inert and trapped in the glass, however, no lab tests are currently being done on these vintage pieces so we have no way to know for sure if these pieces are safe for food contact. It is probable that using vintage milk glass with highly acidic foods or using glass that is scratched may release some of the lead contained in the glass -- as these are common ways lead is able to leach from glass. The problem is that as you use the dish, there is no way to tell that you've reached the point where your bowl or dish is leaching lead. How to tell if Pyrex is vintage? When I talk about lead in vintage Pyrex, I am talking about Pyrex manufactured between the 1940's and the 1980's. The information in this post does not necessarily apply to modern Pyrex, which generally has a clear glass or tinted (but translucent) body. For more information on vintage Pyrex patterns and what year your vintage Pyrex was made, see the database from The Pyrex Collector. Is vintage Pyrex safe to use? The short answer to this is "I wouldn't use it." This was a common response to the test posted on Facebook. People insisted that since food doesn't come in contact with the outside of the bowls, these tests do nothing more than drum up fear. The problem is, that if lead is coming off onto a Lead Check Swab, that means it IS rubbing off - in small, even microscopic (but still dangerous) amounts - and it becomes available to be transferred to your mouth, eyes, or even your child's food or body. Even though you can't see it....every time you touch it...every time you stack it inside another dish...every time you run it through the dishwasher...every time you wipe it with a rag...lead is being sloughed off into your environment. All of these actions will release a microscopic amount of lead from the paint that can contaminate your environment. Since these kinds of things tend to happen in your kitchen, using your vintage Pyrex bowls that are lead contaminated will just continue to contaminate your kitchen space! If you carry the dish to the table and a micro amount of lead comes off on your hands and then you turn around and start preparing your child's food, you're spreading that contamination. If you child touches the dish as it's being passed around the table and gets lead on their hands and then puts their hands in their mouth, they've just ingested lead. As much as I really wish I could tell you that your vintage Pyrex is still safe to use around your family, I would strongly advise against it. Even though the amount of paint transferred with each use is small (so small you won't be able to see it), these tiny amounts of lead build up in our bodies and can have irreversible side effects - especially in children. Is lead really that big of a deal? While chances that you will get acute lead poisoning from using vintage Pyrex are minimal, do not underestimate the damage exposure to tiny amounts of lead can do over time. As lead accumulates in the body, it can cause irreversible damage. Young children are the ones most prone to lead damage as their nervous systems are still developing. Knowing that most lead poisoning is not acute, but rather, happens in very small, microscopic doses over time, I personally try to avoid using any lead containing products in my home because no beautiful object is worth the risk to my family's health. How can I tell if my Vintage Pyrex bowl contains lead? The Lead Safe Mama has a catalog of items she has tested for lead on her website. Go here to see the test results for vintage Pyrex dishes on the Lead Safe Mama website. 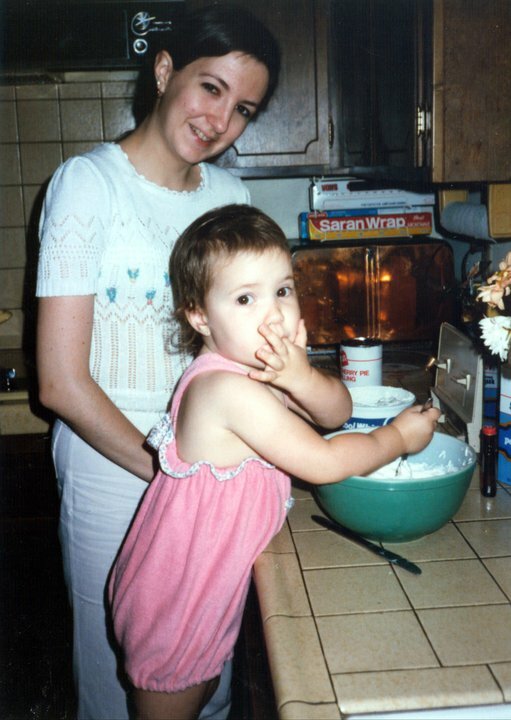 Go here to see the results for vintage Corning and vintage Corningware items on the Lead Safe Mama website. I would start by looking there to see if the Pyrex dish you own is one that has already been tested. Keep in mind that these results are not exhaustive. 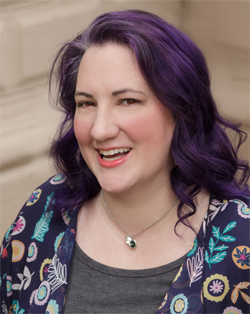 Tamara (Lead Safe Mama) has tested thousands of items over the last decade and has only somewhat recently started cataloging the results on her website. The Facebook group, The Lead (pb) Group, is also a great place to post a photo of the dishes you have to see if anyone has had theirs tested and what the results were. 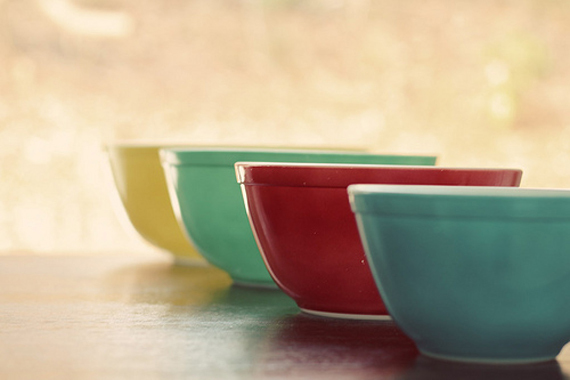 Can I test my vintage Pyrex bowls and other vintage Pyrex dishes for lead at home? The company, 3M, makes a great product called the 3M LeadCheck Swab. This swab contains both liquid and powder inside a plastic tube. When you crush the inner tubes (think: like cracking a glow stick to activate it), the fluid can be used to test things for lead. To use it, rub an activated swab on a suspicious item, being sure the fluid is in full contact with the item.. If the swab turns red or pink, then the item contains 600 PPM or more of lead. It is important to keep in mind that there are limitations to how well you can use this to test vintage dishes for lead. 1) LeadCheck Swabs are designed to test PAINT. They work by rubbing a very small amount of paint off onto the swab where it reacts (or not) with the fluid to produce a positive or negative test result. If you are able to get a LeadCheck swab to return a positive result on any of the above items, that would mean that the item is likely very high lead AND that lead rubs off easily. Definitely not something you want to have at home! It would, however, be appropriate to use on the painted exterior of vintage Pyrex dishes. Read the insert in the box and follow all directions closely. I'm also happy to help you in the Creative Green Living Tribe on Facebook. LeadCheck swabs are really designed to test for leaded house paint. The level the federal government of the United States of America has set for a paint to be considered "lead paint" is 600 PPM. The level of lead that both I and Lead Safe Mama refer to as "the level of concern" for household items is only 90 PPM (this is the guideline set by the Consumer Product Safety Commission for items intended for children). So even if you are testing the right kind of thing with your Lead Check Swab, if it contains 550 PPM (610% more lead than the maximum amount allowed by the CPSC for children's items! ), your swab will not turn pink or red even if the item is leaded. In general, a good rule of thumb for testing your vintage Pyrex (or other items) for lead is that if the swab turns red, it DEFINITELY has lead. If the swab does NOT turn red, it still might have lead and further investigation is needed. Do not make the assumption that a negative LeadCheck Swab means your item is lead safe. 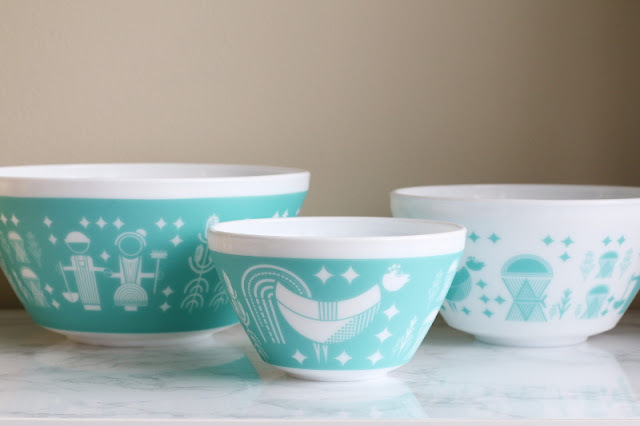 Since this post was originally published in 2015, a company called Vintage Charm has created a line of vintage Pyrex inspired bowls and some of them are lead and cadmium free! This particular design is inspired by the vintage Pyrex Butterprint design and has tested "non-detect" for lead and cadmium (meaning the machine could not find lead or cadmium). What about that Snopes article? Snopes fascinatingly tried to debunk a previous version of this article in 2016 but failed. Click here to read more about my response to Snopes and how they missed the key piece of information they needed in order to cover this issue accurately. Carissa works closely with Lead Safe Mama to test consumer goods for heavy metals and recommend safer alternatives. Her projects have been featured in magazines like Kids Crafts 1-2-3, Capper's Farmer and Urban Farm Magazine. She is a frequent guest on Afternoon Live, a live show that airs on KATU. Follow her on Pinterest, Instagram, Twitter or join the Creative Green Living Tribe on Facebook. I tested the inside of my vintage Pyrex bowls and there was lead. What about leaded glass such as Waterford? What about depression green glass that contains uranium? Is that safe to use? What timeframe are we calling vintage? Shouldn't one have permission to public quoted statements? I recall those comments being made in a private collectors group. How did you get them?? If you're talking about the common objections attributed to "a Facebook User", these objections are common enough that I see them all over public forums whenever this information from Lead Safe America comes up. I am not in any private collectors groups on Facebook so I haven't lifted the comments from there. Is there lead in the vintage pyrex plates that are oven safe? There are some vintage pyrex baking dishes that have paint/color on the outside that have lead. You could get lead check swabs to check your dishes specifically. I have a vintage blue glass Pyrex bowl. There is no paint on it, nor has there ever been. Do you have information on this? Thank you for your post; it's informative. Thank you. I've definitely heard that before! Would love to know what people are doing with their pieces now we know they have lead. I have a stack of them in my kitchen I can't quite bring myself to throw in the garbage-seems so wasteful, but feel like it's not right to donate to thrift store where people who don't know they contain lead will use them. What should we do with these dishes? That's a great question. I know people who are leaving them as display-only pieces-ideally in a closed China cabinet to avoid them accumulating dust and needing to be dusted. Do you have an updated advice on disposal of a pyrex bowl with lead? Recycle ,household hazardous waste drop off or landfill? In the past I have sold things with lead and given a disclaimer in the listing. I feel it would be wrong for someone to acquire a leaded piece because they didn't know about it but feel ok as long as they KNOW. So if you wanted to sell your pieces to a collector, the listing could say something like "Like all vintage Pyrex, this piece is painted with lead paint. It is not suitable for kitchen use and best suited for a collector." If you don't feel good about that, I would send it to the landfill. It is not recyclable and the hazardous waste people won't take it. I have a bad feeling that this could include my Corningware Cornflower bowls. Please tell me that this isn't so! Not attacking you or doubting you but my 93 94 in 2 days grandmother has been using Pyrex since a child and has had no issues alot of the bowls are faded and loosing their shine but still uses them. My question is why hasn't Pyrex issued a recall ? If the lead is really that bad why hasn't Pyrex been held resposible ?? Just wondering I hope to use my grandmothers Pyrex for 70 more years to come ! I'm glad to hear your 94 year old grandmother is in such good health! Just like smokers who never develop lung cancer, knowing someone who seems unaffected by their exposure to a known toxin is not necessarily evidence that exposure to that element is safe. Hopefully she passed that genetic resistance to toxins on to you! Pyrex hasn't issued a recall because nothing about the amount of lead in their products is illegal. Pyrex maintains that their product has always met all applicable government guidelines for their products - and indeed, there were not guidelines in place when their vintage pieces were being manufactured (no guidelines means they didn't break any!). Pyrex is by no means the only vintage dish manufacturer that has lead in their finishes and there is no real means by which the government can regulate vintage dishes that are no longer in production. As these products age and the integrity of the glaze starts to disintegrate, you will find yourself exposed to more lead than your grandmother was when she was your age. You may want to consider making these pieces display items only. Or photograph them and keep and display the photos. I have some vintage Anchor Ovenware Casserole dishes made in the USA (amber colored). Have you tested any of these? Thank you!